The British government is facing claims it "aided and abetted" violations of international law by allowing US arms flights to Israel to use UK airports. The Islamic Human Rights Commission is seeking High Court leave to challenge government bodies over what it says are crimes against the Geneva Convention. 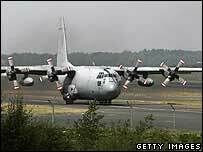 A number of US planes said to be carrying bombs to Israel refuelled in the UK during the Lebanon conflict. The IHRC says it received complaints from Britons with families in Lebanon. The commission is accusing the government of "grave and serious violations" of international humanitarian law. It is seeking permission in the High Court to bring its case against the Civil Aviation Authority, the Foreign and Commonwealth Office and Defence Secretary Des Browne. The IHRC said it was bringing the case after receiving "many complaints... from British citizens whose family members are in Lebanon and facing grave danger as well as acts of terror". The US aircraft believed to have refuelled in the UK are said to have been carrying supplies including "bunker buster bombs".